When it comes to skip hire, whether it’s for domestic removal or construction projects, our range of skips is sure to meet your requirements. The largest size we can offer at Britannia Skips is a massive 14 yard skip. Similar to the 10 and 12 yard skips, the 14 yard skips must only contain light materials. It is perfect for large scale building projects and house clearance, when you have items that are bulky but light-weight. 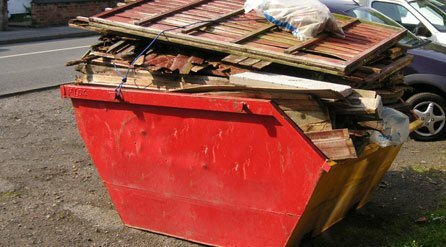 It is not suitable for heavy wastage such as earth or concrete; for this, you would use the maximum size of an 8 yard skip. This skip measure in at 14 cubic yards (12.8 cubic metres) with dimensions of 79 x 67 x 84 inches. It can fit approximately 200-220 bin bags worth of waste. It is a great choice if you are concerned you need more space than the smaller skips can offer. If the 14 yard skip is your chosen skip, give us a call today and you can expect delivery as soon as possible with our same day delivery service. If in doubt, don’t hesitate to call us and we will happily advise you based on your project details, able to assess your requirements to find the ideal skip for you. We can also help with the important task of gaining council licence permits to place your skip. Our team have expert knowledge of legal requirements, and are also able to help with your other skip-related questions.